Summary: Alp Lake basin is located in the Taylor-Hilgard section of the Lee Metcalf Wilderness in southwest Montana, west of the NW corner of Yellowstone National Park. 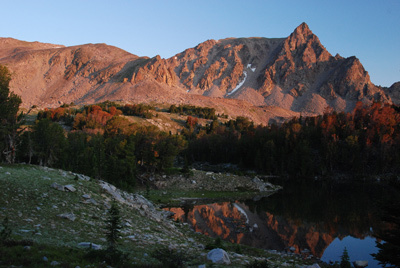 The most direct route into the basin involves a 7.5 mile hike which gains 2400 feet. For folks who feel most comfortable hiking on a maintained trail, this destination is not for you. The last 2 miles or so into the basin involves easy off-trail route finding, and of course, some steep climbing. It is worth every extra calorie expended. To do this as a single night's backpack is doing this place an injustice. Allow 2 nights so you can explore the basin. How to get there: The trailhead is at the SW end of the Taylor Fork Road, about 10.5 miles from US 191, The Taylor Fork Road, FS 134, starts 14.2 miles south of the junction of US 191 and MT 64. UTM for the trailhead is NAD27 12T, 470575 E, 4987962 N.
Report: The trail starts in open country and heads southwest along the valley of Taylor Creek. It turns and heads south along Lightning Creek. However, we found, using a GPS track, that in many places, it does not follow the trail as marked on the USGS quad. It goes past some private in-holdings, using part of a road. It descends to a crossing of Lightning Creek, and takes some steep switchbacks to climb into the valley of Alp Creek. On a warm summer day, the next mile or so can be toasty, as you are hiking across old avalanche tracks. A bit less than 5 miles into the hike, the trail enters Sedge Meadows. 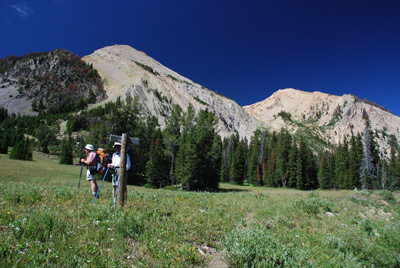 If you are careful, you can find a trail heading to the east and then south for a saddle at 9220 feet, and on to Sentinel Creek, which offers access to Hilgard Basin. We essentially lost the main trail to Alp Lakes in these meadows, but picked it up again at the south end of the meadow. Take your time and you should be fine. After Sedge Meadows, the trail, south of where it is shown on the map, climbs up into another meadow. It is at the far end of the meadow, about 1.5 miles short of the basin, that the trail disappears. If you are trying to follow the trail as marked on the USGS map, don't bother. Having done the off-trail route in both directions, the easiest way to go is to follow the route in red as marked on this map, Yeah, it will be steep in spots, but hey, this is off-trail route finding. After the route (not trail) crosses Alp Creek, it runs about 150 meters to the west of where the route is shown on the map. Be careful when crossing the creek, as the rocks are slippery. One of our party slipped, fell in the creek and broke her finger. Eventually, we broke out into the open, crossing a rock filled stream bed and continue to climb. Eventually, we curled up an open slope and found a campsite near 12T, 465373 E, 4980644 N. And a great one it was. Our layover day was spent exploring the basin, and climbing to the ridge SW of camp. From this spot, you can see into the valley of Sentinel Creek and over into Hilgard Basin. Hilgard Basin is bigger than Alp Lakes Basin, but it also has vastly more people. We saw no one on our trip once we cleared Sedge Meadows on the first day. We departed on the morning of Day 3, retracing our steps. Stopping for beer and killer onion rings at the Corral six miles south of Big Sky on US 191 is nearly obligatory (www.corrallbar.com).